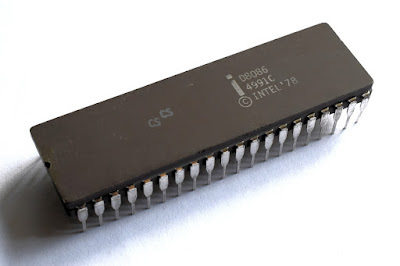 By the late 1970s, Intel had carved out a successful slice of the microprocessor market with the 8-bit Intel 8080 and Intel 8085, but rivals such as the Zilog Z80 and MOS 6502 were eating into that share. Intel had been trying to design a radical 16-bit CPU – the iAPX 432 – since 1975 but that was still nowhere near completion. As a quicker way of getting a 16-bit processor to market, Intel took some of the features of the existing 8085 and greatly expanded on it, making it much more powerful while maintaining some level of backward capability. The new 8086 was developed by a small team in just two years - the iAPX 432 took six years and a much larger team. In 1978 the 8086 was ready to hit the market, clocked at 5 MHz and priced at under $90 a unit. It soon found its way into professional and scientific computer systems, but it finally got a big break in 1981 when the IBM PC was launched with a cut-down version of the 8086 called the 8088 inside. The IBM PC and its clones ensured the success of the 8086 and 8088, and several generations followed. In June 2018 – to celebrate the 40th anniversary of the 8086 – Intel announced a special edition of their current processor called the Core i7-8086K which is a 64-bit CPU clocked at 5 GHz, with 6 CPU cores. The 8086, its descendants and compatible processors from rivals sold in huge quantities… not bad for something that was a bit of a stopgap. The iAPX 432 turned out to be too much of a technological leap for any company to make in the 1970s and ended up as a disaster. In the end, the simpler solution to the 16-bit problem was the more effective one. There’s probably a lesson in that.